Like these chewy lemon cookies. As soon as I saw the recipe, I knew that I would love them even more if I added ginger to them. As a trial run, I added one teaspoon of dried ginger powder to the recipe and the cookies disappeared in no time. But I longed for something more: crystallized ginger. I decided to make my own but that was soon relegated to being yet one more thing on my unending to-do list. It took a trip to the nearest Trader Joe's in Santa Fe, New Mexico, to rekindle the need for those cookies. I picked up both kinds: crystallized as well as uncrystallized. No prizes for guessing which kind of ginger I prefer! I usually miss the small trickle of Meyer lemons that make their way into Colorado. The organic ones at Whole Foods are snapped up almost immediately—before I even find out that they are available. I was, therefore, thrilled to find them at Costco. So what if they weren't organic. So what if they came all the way from California. Most of our produce comes from outside the state in winter, anyway. Cream together unsalted butter, lemon zest, sugar and honey until very smooth, scraping down the sides as necessary. Add lemon juice and chopped ginger (or ground ginger) and mix until combined. Add flour mixture to the creamed mixture on low until just combined. Scrape down the sides of the bowl with a rubber spatula and bring the dough together by hand. Roll the dough into one inch balls and bake for 10-12 minutes or until barely golden. Resist digging in even though they smell divine, and let them cool on a wire cooling rack. The original recipe suggests using either agave nectar or honey. I used agave nectar when I made these cookies with ground ginger because I'm trying to finish the two large bottles of organic agave nectar I currently have. (Read this for more info on agave nectar if you, too, were conned into believing that it is better than a natural sweetener.) I also added baking soda to the lemon juice as suggested. The cookies rose and then flattened. They weren't chewy but were still delicious. I made two changes in my next batch: I added the baking soda to the flour mixture and used honey instead of agave nectar. The cookies were nicely chewy and had a better flavor profile than when I used agave nectar. Use regular lemons if you don't have access to meyer lemons. I made a batch each with crystallized ginger and uncrystallized ginger. Medha loved the former because they were sweeter while I loved the latter because the taste of ginger really came through. You could roll the cooled cookies in confectioner's sugar, if you like. I skip that step as it makes the cookies far too sweet for me. I prefer to lightly dust them with sugar before serving. Just like a dusting of snow. I love these cookies because they combine two of my favorite flavors: lemon and ginger. To me, that's a win! 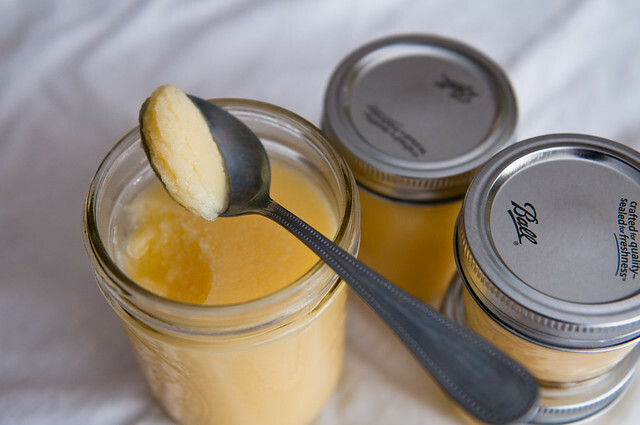 If you missed my last column on the Whole Foods Market Cooking blog, I reminisced about the process of making ghee from homemade butter, followed by a recipe for making it from store-bought unsalted butter. I love that second photo of the tea with the cookies. So warm and cozy. And I love TJ's uncrystallized ginger. Did not even try the crystallized one once I had it. I have to say, I have never had Meyer lemons in my entire 39 and a half years on this earth. (Note to self: add to the bucket list). Love the ghee photoo too. Why do they call them Meyer lemons? 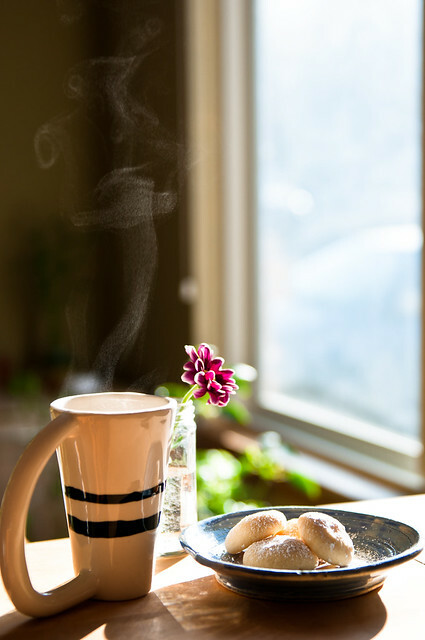 I love the mug and the steam rising from it. I have never tried TJ's uncrystallized or crystallized sugar. What with your post and Jaya (DSM)I must pay a visit. Are Meyer Lemons different from regular lemons? DSM, thanks! 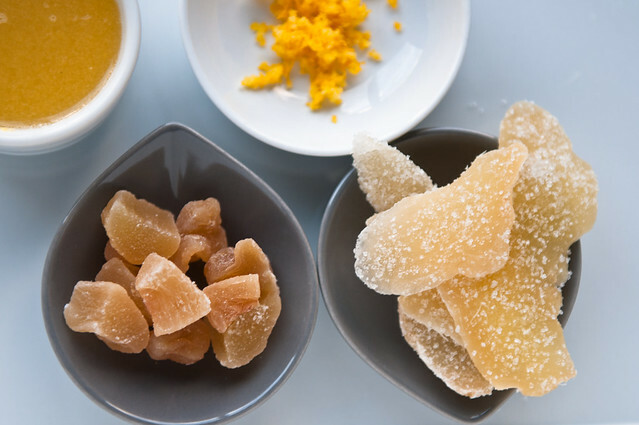 And, yes, TJ's uncrystallized ginger wins for me, too! Although I quite like the uncrystallized ginger, too. Meyer lemons were brought to the US from China by an agriculturist named Frank Meyer, therefore the name. Manasi, thank you! I have very specific things I like to get from TJs and crystallized as well as uncrystallized ginger are two things I never leave without. The first thing I have to grab are the triple ginger cookies! See a pattern here?! 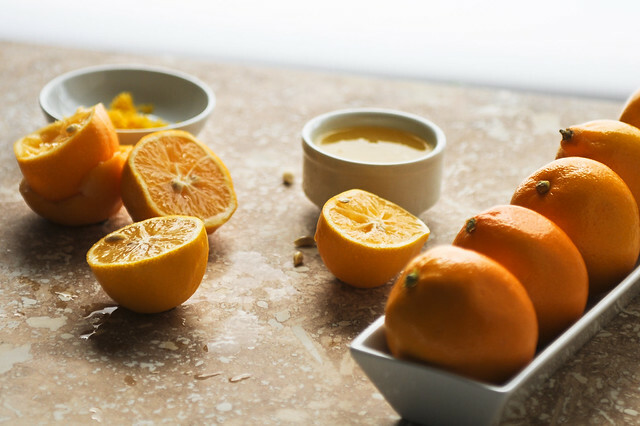 Meyer lemons are a cross between mandarin oranges and regular lemons. They have a much thinner skin, are sweeter and a lot less acidic. I saw them for the first time in Costco this year; otherwise stores like Whole Foods and Vitamin Cottage usually carry them when they are in season. The juice of these lemons is so - yellow! Lime and lemon are a good combination as well. If I attempt these, it will have to be with lime and ginger! 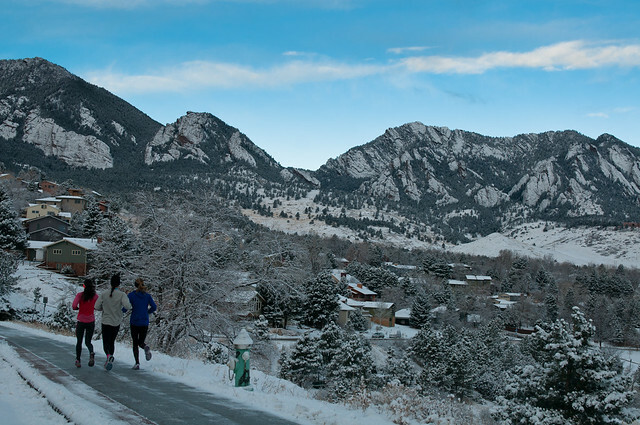 Enjoy your snow - we are almost at the end of winter here. Spring is just round the bend. But Spring or Summer, chai is always in season! I've been thinking of these cookies on and off all day- I want. I want two of three dozen of them wrapped up nicely with my shipment of potential pickles. Thank you. Actually, I'm also in the midst of my own little Meyer-lemon project. It probably won't turn out, but if it does, it should prove interesting. It's a joy either way to work with the scent of the peels as the oil-pockets are burst by the slicing- such a fine perfume! It would go well with vetiver/khus. 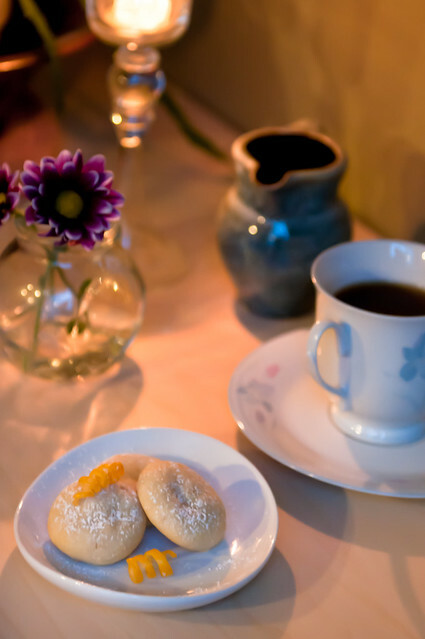 I adore Meyer lemons and ginger together and your cookies and Chai look delicious. Last year I made a Meyer lemon and crystallized ginger marmalade - quick, easy, delicious and in a pressure cooker. Anita, do you have access to un/crystallized ginger? Or will you make your own? Or will the Kashmiri in you want to use soonth? And, yes, chai is *always* in season! Pelicano, you want, you make, you get! But I'll bite and ask: what is in those potential pickles? You're making a Meyer lemon itr?! Lee, that sounds delicious! Please send me the recipe if you have it handy. I would love to try it out while these lemons are still in season! You can get dwarf Meyer lemon plants to grow in your home if you have enough room. They smell lovely and after a few years produce fruit! Manisha, I emailed you about the recipe. Let me know if you try it! 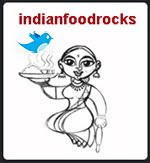 Good Blog Very Interesting To Read, Very Descriptive Content Written After Reading Your Blog I Can Say Indian Food Rocks.